Solidago mollis (soft goldenrod) occurs throughout the Great Plains but is less common along the eastern edge of the region. Its occurrence in Minnesota is at the far eastern edge of the species' range, and it is currently limited to just three to four counties along the western border of the state (Traverse, Big Stone, Lac qui Parle, and possibly Lincoln). There is also a record of the species in Pipestone County, but it has not been seen since 1899. Historically, S. mollis may have occurred in several more adjoining counties, but it was never widespread in the state. Populations of S. mollis are generally small, as are the habitat patches where the species is found. Within its limited geographic range in the state, much of the potential habitat for S. mollis was lost through the conversion of prairies to agriculture and other uses. In fact, of the original 7.2 million hectares (18 million acres) of prairie that occurred in Minnesota, less than 2% remains intact. The habitats that do remain are often found in dry hilly pasture lands. Such areas were often considered less suitable for cultivation than more mesic prairies (Minnesota County Biological Survey 2007), and instead used for livestock grazing. In that sense, grazing prevented the destruction of the species' prairie habitat. However, grazing itself can present conservation threats and the conversion of pasture land to other uses remains a threat. The glacial till and sand and gravel deposits underlying many hilly prairie habitats are under pressure to be mined because of the demand for road gravel. Because of its limited geographic distribution, small population sizes, and threats to its habitat, S. mollis was listed as a special concern species in Minnesota in 1984. Like most goldenrods, S. mollis flowers in summer and early fall and is easily recognized as a goldenrod by its clusters of yellow flowers. It grows up to 0.5 m (1.6 ft.) tall, or somewhat taller, and can be seen growing as a single stem or as clusters of stems since it spreads underground by rhizomes. The leaves and stem are densely covered in minute stiff hairs, giving the plant a somewhat gray-green appearance. The flowers are bright yellow and arranged into 50-300 small heads. Each head will have 6-10 ray flowers and 3-8 disk flowers. The heads are in turn densely packed into a cylindrical to pyramidal inflorescence. The leaves are thick and firm and have 3 prominent nerves. Their margins are irregularly toothed or without teeth. The leaves on the middle of the stem are lance-shaped or elliptic to ovate. They measure 1-6 cm (0.4-2.4 in.) long by 0.4-2.0 cm (0.2-0.8 in.) wide and are sessile or short-stalked. The leaves on the lower part of the stem often dry up by flowering time. Leaves toward the top of the stem tend to be smaller than the leaves mid-stem (Great Plains Flora Association 1986; Semple and Cook 2006). In comparison to S. mollis, the mid-stem leaves of the common S. altissima (Canada goldenrod) are usually longer and proportionately narrower, and they have a long slender tip. 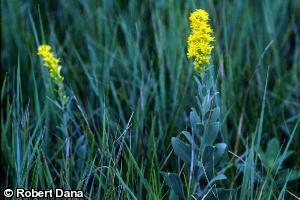 In Minnesota, S. mollis is most often found in dry prairie, but is sometimes found in mesic prairie. Both types of prairie are dominated by grasses, but in dry prairie the mid-height and short grasses are prominent, while in mesic prairie, tall grasses dominate. Forb cover in both types is sparse to patchy. Solidago mollis is typically found on the moister end of dry prairie (known as dry-mesic prairie) and on the drier end of mesic prairie. This moisture regime is reflected by the topographic position where S. mollis is usually found. It is typically on gentle to moderate slopes, level uplands of blufftops, or on gentle prairie knolls (slightly elevated above the surrounding landscape). The soils in these locations are not as dry as they would be on steep slopes or the crest of slopes and ridges, or as moist as they would be on level lowlands. The species may be found on east-, west-, or south-facing slopes. Prairie plants often growing in association with S. mollis include Bouteloua curtipendula var. curtipendula (side-oats grama), Pascopyrum smithii (western wheatgrass), Solidago rigida (stiff goldenrod), Liatris punctata var. punctata (dotted blazing star), and Dalea purpurea var. purpurea (purple prairie clover). Traverse and Big Stone counties together contain 2/3 of the extant populations of S. mollis. The populations in these counties are concentrated on morainic bluffs above the valley of the historic Glacial River Warren. These bluffs have clay loam soils formed in glacial till. In Lac qui Parle County, there are two S. mollis populations found on glacial kames in gravel and sand deposits. In Lincoln County, one population occurs on a loess-capped ridgetop. Solidago mollis is insect pollinated. It reproduces by seeds or can spread vegetatively by rhizomes. It has a pappus of numerous white bristles ringing the top of the seed. As with many plants in the sunflower family, these bristles may be caught by the wind or latch onto passing animals, dispersing the seed to other locales (Great Plains Flora Association 1986). The remnant habitats for this plant are mostly in hilly, grazed landscapes (either currently grazed or managed for grazing in the past). Given this setting, S. mollis faces several threats. The first is simply overgrazing. Overgrazing causes erosion, which may degrade the species' habitat. Second, the common practice of managing pastures with herbicide to control Cirsium spp. (thistles) threatens prairie forbs (Minnesota County Biological Survey 2007). Third, many pastures are heavily invaded by non-native cool-season grasses such as Poa pratensis (Kentucky blue grass) and Bromus inermis (smooth brome). Also, pastures where grazing has ceased can be invaded by Rhus glabra (smooth sumac) or other weedy shrub and tree species, which shade out the sun-loving plants that grow there. The forth and largest concern for S. mollis, and other species that share its habitat, is sand and gravel mining. The sand and gravel deposits often present in the moraines and outwash deposits where S. mollis grows are in high demand for use in road construction. Mining the gravel substrate obviously destroys the prairie habitat and the plant populations that are present. Habitats supporting S. mollis must be protected from aggregate mining if this species is to survive in Minnesota. Apart from habitat protection, prescribed fire is the primary management activity that is necessary. Fire keeps encroachment of invading shrubs and trees in check and helps reduce the dominance of non-native cool-season grasses. Several programs and resources are available to land managers and landowners to help protect and manage remaining prairie parcels including the Native Prairie Bank Program, the Native Prairie Tax Exemption Program, and a prairie restoration handbook. The best time to search for S. mollis is when the plants are in full bloom, from July to early September. Several populations of S. mollis are located on publicly owned lands including a Wildlife Management Area and three Waterfowl Production Areas. Two populations on private lands are protected through conservation easements and two additional populations are on lands owned by a private conservation organization. Although no known efforts have been undertaken to specifically manage for S. mollis within these areas, brush management in the form of prescribed burns has occurred on at least two of the sites. Great Plains Flora Association. 1986. Flora of the Great Plains. University Press of Kansas, Lawrence, Kansas. 1,402 pp. Semple, J. C., and R. E. Cook. 2006. Solidago. Pages 107-166 in Flora of North America Editorial Committee, editors. Flora of North America north of Mexico. Volume 20. Oxford University Press, New York, New York.